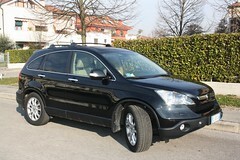 There are a lot of high quality 2011 SUV models for buyers to choose from. But what are the top 10 2011 SUVs? We look at models across the SUV segment from compact to luxury and make our picks. The list below is in order of starting MSRP. 1. Honda CR-V – The top selling SUV in the U.S. is a great compact model with more cargo capacity than midsize models such as the Ford Edge and Nissan Murano. 2. Subaru Outback – The Outback won Motor Trend’s 2010 SUV of the Year award. This is no longer your dad’s station wagon. This midsize offering offers more space than the Jeep Grand Cherokee. All-wheel drive comes standard. 3. Kia Sportage SX – Want power, fuel economy, and utility in an affordable package? The turbocharged Sportage SX may be what you are looking for. 4. Ford Explorer – The Explorer saw big changes for 2011 making its debut as a crossover model. 5. 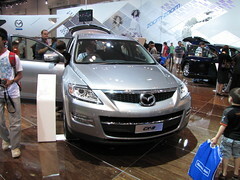 Mazda CX-9 – This large three-row seven-passenger crossover won Motor Trend’s 2008 SUV of the Year award. It boasts 100 cubic feet of cargo room, 25% more than the Explorer. 6. Toyota Highlander Hybrid – The most fuel-efficient mid to large size SUV on the road with 28-mpg city and 28-mpgh highway. Be prepared for its $40,000+ starting price. 7. Chevy Suburban – A survivor from the era when all SUVs were truck based, the Suburban offers great towing capacity and cargo room. With seating capacity for up to nine passengers, it is a solid choice for large families and boat owners. 8. Audi Q7 – This luxury three-row luxury crossover offers a standard 8-speed automatic transmission across trim lines. It has ditched a V-8 engine option in favor of a supercharged V-6. A diesel engine option is offered for better fuel economy and torque. 9. 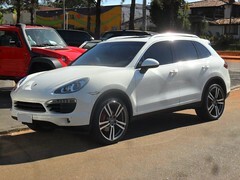 Porsche Cayenne – The 2011 Motor Trend SUV of the Year award winner is a five passenger SUV that offers luxury and performance starting at below $50,000. A hybrid engine is offered that gets 22-mpg city and 24-mpg highway for the fuel-efficient minded. 10. Land Rover LR4 – No top SUV list complete without a Land Rover or Jeep on it. This most capable luxury off-roader has a whopping 5.0-liter 375 horsepower engine while accommodating up to 7 passengers. Surprisingly it has a starting price below $50,000. But be ready to get 12-mpg in city driving. This top ten 2011 SUVs list represents some of the best choices among this year’s SUV classes. 2011 SUV trends show the shift towards more crossover models and more fuel-efficient engines. Other top 2011 SUVs include the BMW X5, Jeep Grand Cherokee, and Toyota RAV4. Which is your favorite 2011 SUV model?